Transparency Market Research (TMR) has published a new report titled ‘Biopharmaceutical Fermentation Systems Market - Global Industry Analysis, Size, Share, Growth, Trends, and Forecast, 2018–2026.’ According to the report, the global biopharmaceutical fermentation systems market was valued at US$ 10.0 Bn in 2017 and is projected to reach US$ 17.8 Bn by 2026, expanding at a CAGR of over 6.0% during the forecast period from 2018 to 2026. Biopharmaceuticals is an exponentially growing therapeutic segment, with several novel therapies in pipeline. Microbial produced biopharmaceuticals generated revenue of around US$ 100 Bn in 2017 and the segment is estimated to expand at a significant CAGR. The global biopharmaceutical fermentation system market is driven by increased usage of fermentation derived products in various industries across the globe due to their natural structure, low cost, and better output. Moreover, rise in research and developmental activities in different fields of fermentation technology, technological advancements, rise in awareness about products, and launch of new products are the factors expected to drive the market in the near future. Increase in geriatric population, rise in prevalence of chronic diseases across the world, and surge in health care expenditure propel demand for biopharmaceuticals. This in turn is likely to fuel the growth of the global biopharmaceutical fermentation systems market during the forecast period. Several pharmaceutical companies are engaged in research and development of innovative new formulations and biological drugs to meet the unmet therapeutic needs. For instance, Biocon, India’s largest, innovation-led, fully-integrated biopharmaceutical company which ranks among top three biosimilar global players for insulin, has commercialized the rh-insulin (recombinant human insulin) through Pichia fermentation technology. Rh Insulin and Insulin Glargine are registered in over 60 and 20 emerging markets, respectively. The report offers detailed segmentation of the global biopharmaceutical fermentation systems market based on product type, application, and end-user. The market has also been segmented based on region (North America, Europe, Asia Pacific, Latin America, and Middle East & Africa). Development of new biotherapeutics with smaller molecular weight is expected to drive adoption of fermentation systems. Usage of these systems for production of antibody fragments, antibody drug conjugate (ADCs) components, and small peptide fragments is likely to increase in the near future. Introduction of personalized medicines and varying product portfolio are likely to propel demand for more flexible and small to medium capacity production systems for fermentation. Instead of using large capacity fermenters, biopharmaceutical manufacturers can rely on small scale single use systems with capacity of 100 liters to 500 liters to produce these biotherapeutics. Technological advancements in bioproduction and development of genetically engineered microbial strains contributes to the high yield of microbial-based biopharmaceutical production. Stringent regulations and trend of continuous manufacturing & single use technology are poised to augment the downstream process products segment. In terms of application, the recombinant protein segment is expected to account for a leading share of the market by 2026. The segment is also likely to expand at a rapid pace during the forecast period. Advancement in recombinant technologies such as gene translation in microbial systems is anticipated to drive the segment. Use of these systems in production of antibody drug conjugates (ADCs) is projected to propel the segment during the forecast period. Moreover, microbial systems have been widely used in the production of recombinant protein since the introduction of insulin produced using genetically engineered E.coli strains. Technological expertise, high production capacities, and large number of raw material suppliers have contributed to the leading share of the segment. 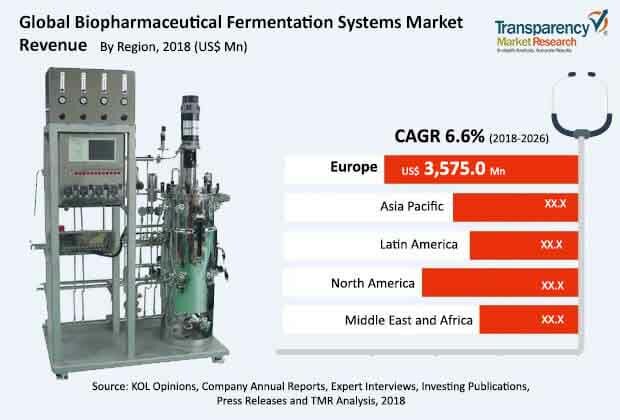 Asia Pacific is expected to present significant opportunities in the biopharmaceutical fermentation systems market due to changing economic profiles, rapid urbanization, rise in health care spending and investment, and increase in incidence of chronic lifestyle diseases. However, in terms of revenue, North America was the leading market for biopharmaceutical fermentation systems in 2017. The market in North America is anticipated to witness moderate growth during the forecast period. Presence of key players, well-established health care infrastructure, increase in geriatric population, and rise in health care expenditure propel the market in the region. The global biopharmaceutical fermentation systems market is highly fragmented, with top five players accounting for major share. GE Healthcare, Merck KGaA, Thermo Fisher Scientific, Sartorius Stedim Biotech, and Danaher Corporation are the five leading players operating in the market. Merck KGaA and Sartorius Stedim Biotech are likely to continue to hold significant market share during the forecast period. The companies have strong presence in the fermenters segment. Merck KGaA is projected to witness strong growth in Asia Pacific during the forecast period, owing to increase in investments made by the company in infrastructure development and development of new products. Major companies profiled in this report are GE Healthcare, Thermo Fisher Scientific Inc., Danaher Corporation, Sartorius StedimBiotech, Merck KGaA, Eppendorf AG, F. Hoffmann-La Roche Ltd., Nova Biomedicals, Lonza, and Becton, Dickinson and Company.